CARFAX 1-Owner, Excellent Condition, L/ Certified, ONLY 8,857 Miles! Sunroof, Heated Leather Seats, NAV, Alloy Wheels, Keyless Start, iPod/MP3 Input, Onboard Communications System, Back-Up Camera, Quad Seats, SPORT PACKAGE CLICK NOW! 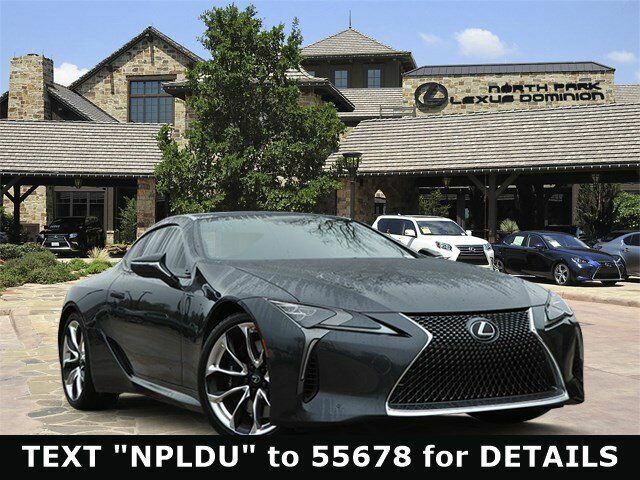 Safety equipment includes Lane Keeping Assist Lexus LC 500 with Smoky Granite Mica exterior and Black interior features a 8 Cylinder Engine with 471 HP at 7100 RPM*. MP3 Player, Sunroof, Keyless Entry, Remote Trunk Release, Steering Wheel Controls. WHEELS: 21" FORGED ALUMINUM Tires: P245/40RF21 Front & P275/35RF21 Rear, SPORT PACKAGE Heated & Ventilated Front Sport Bucket Seats, 10-way power driver seat, 2-way power driver and passenger lumbar support and memory for driver, RADIO: MARK LEVINSON PREMIUM SURROUND SOUND SYSTEM AM/FM tuner, DVD/CD player, 13 speakers, advanced discrete amplifier design w/835 watts max, power and 7.1-channel speaker architecture, CONVENIENCE PACKAGE Blind Spot Monitor, lane change assist and rear cross traffic assist, Front & Rear Clearance Backup Sonar, COLOR HEADS UP DISPLAY, LIMITED SLIP DIFFERENTIAL, ALL WEATHER PACKAGE Windshield De-Icer, Heated Steering Wheel, adjustable temperature settings and warmth for driver's hands regardless of grip position.